"Massal selection is a kind of survival of the fittest for vines where cuttings from only the best vines are propagated. This is accomplished through field selections. 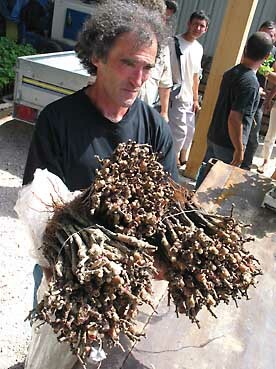 In France, many Burgundy houses are going back to this technique by taking cuttings from their old vines. The belief is that vines lose their identity through clonal selection. 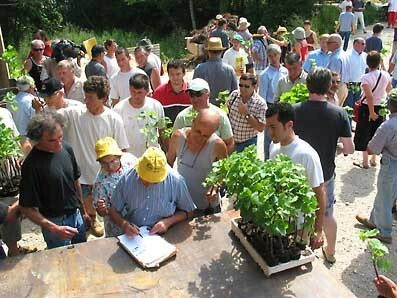 Massal selection differs from clonal selection in the following ways: a clone is a vine propagated from one single vine, a mother vine, and each plant is identical in DNA and uniform in personality; massal selection involves choosing a number of outstanding vines from the vineyard and then propagating new vines from that budwood; and the selection process continues from one generation to the next. The vines then are from the same family, with the same genes, but the individual plants are not identical. " This story has been going on for some time and suddenly , ONIVINS sent certified mails to order the destruction of these vine grafts , as having been transferred from Burgundy to the Loire Valley without some precautionary measures to check that no diseases were present in the vines . 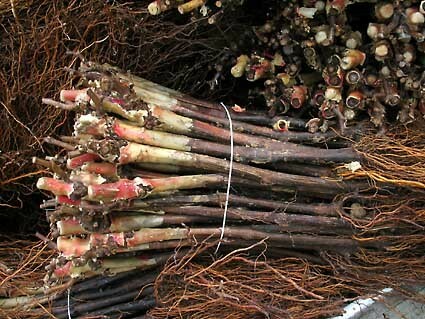 They claimed Burgundy had had some cases of "flavescence dorée", in english red coloration of the leaves, and that the correct procedures to transfer the vine grafts having not been correctly followed , the destruction was the only way out . 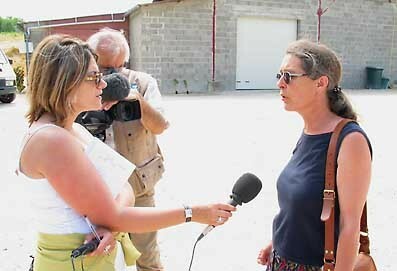 Catherine Roussel, of Clos Roche blanche, for wich the vine grafts were intended, being interviewed that day by TV channel FR3 Gregory Loras states that he thought he had followed the rules, as this is supposed to be legal to use massal selection vines in France, and as he also declared officially the vine grafts purchase and existence. But the rules and legislations in France are quite many and complicated and it seems that in the maze of regulations, something was not right, for the viticulture control body at least .That's when the story turned bad : he received the destruction order in november 2004 . He then asked for a derogation , as the disease risk was low, and that according to many experts, a hot water preventive treatment of the roots could make the vines disease-proof . He also pointed to the tough situation in wich his business was, and to the fact that this affair could bankrupt him . No way, the state body kept asking for the destruction of the 12 000 vine grafts . So, Mr Loras sent a letter to ONIVINS in wich he said the destruction would be realized june 24, and that friends, vignerons, and several media people would be present to witness the destructive relentlessness of the control agencies . Then , contrary to all expectations , the ministry ( a higher authorithy than ONIVINS ) , wich probably saw bad publicity about the possible dysfunctions of its many layers of commandment, sent hastily a delay ( sursis à execution, in french ), possibly more to have the story away from the spotlight than to reverse its policy . Mr Loras hesitated, but considered this was a tactical move to buy time and wear him down , so he decided to stand by the date he chose to destroy the vine grafts . This is the story , culminating with a sad day for him . 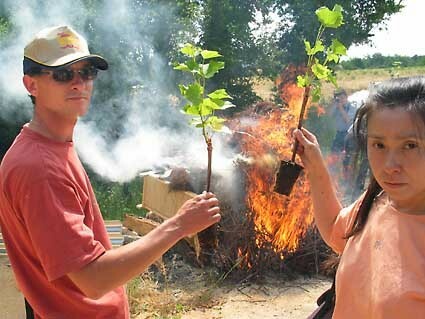 This young man started his winery and tree nursery business in 2001, and he feels defeated by this affair . Plus , we are dealing here with wineries which work very well, respect the nature , make beautiful wines that sell and export very well, that is, exactly the type of wineries and vignerons that took the right path to quality. These people don't ask for help, or subsidized prices, they just ask for a little understanding from the state agencies and civil servants. After Gregory Loras , several people took the mike to express their dismay in the face of this counterproductive bullying. Jean Pierre Mercier, himself punished by the state agencies and obliged to destroy 87 000 vine grafts, said a few words to the people present. Then Pascal Frissant, from the Confederation Paysanne, who had a few harsh words for the unknown state employees who take the decision to destroy, saying that he defied anyone to find a name, a physical person behind such a decision, as they usually hide in the anonymity of inscrutable administrations. He also said that if this case had been signaled to his group earlier, it maybe could have been successfully resolved. Then Mikael Bouges, a vigneron himself, speaks, and says that this looks like a war against something that means life, as these massal selections are a typical example of revitalization of the vineyard toward authenticity and life. Then, Catherine Roussel ( from Clos Roche Blanche , which was supposed to receive and plant the grafts ) , speaks. She is very emotional and calm, and makes several pauses of silence, on the verge of crying ( she actually cried when the fire started ). She says that she is very disappointed of all this administration-ordered waste, and also that she loves her winemaker job and does everything to make a better work , which is good for the region and the country... At last, Didier Barrouillet, associate of Catherine ( Clos Roche Blanche ), says thank you to the crowd for the sympathy that they manifested this day, and he regrets that the local viticulture- and winery unions didn't move nor proposed their help. Tragic. This makes me very sad.